The Marcy Stop: Hats Off! Custom Straw hat c/o Gigi Burris, Forever 21 crocheted dolman (similar here), American Apparel cutoff shorts (similar here), Rebecca Minkoff tri-zip satchel, Guess watch, Nordstrom ID bracelet, Ralph Lauren strappy sandals (last seen here). Shot by Isaac Lacey. At this point, my love for hats is probably pretty obvious. I'm a sucker for all colors and kinds. From floppy straw hats for summer, to wide-brimmed felt ones for Fall, it's hard to find one that I won't wear. That's why I was over-the-top excited when Gigi Burris, one of this year's CFDA finalists who also happens to be a designer that my creative agency works with, offered to make me two custom hats as a thank you gifts. How many people can say they have a custom creation from a CFDA finalist?! Not only did I get to choose the material and shape of each hat, but I was also given a first-hand look at the age-old millinery techniques that she uses. Talk about talent... Gigi is seriously bursting over with it. The hat I'm wearing above is the more summery version of the two that we made together, and I couldn't be more thrilled with the results! Can't wait to share the other design with you, though that will likely have to wait til cooler weather hits. what a chic look stunner. Lovely outfit! The hat is super pretty! That hat is so unique, love the colour combo and how you styled the look. Love the amazing weave of your custom hat, dear Lauren...and the pretty colour!! 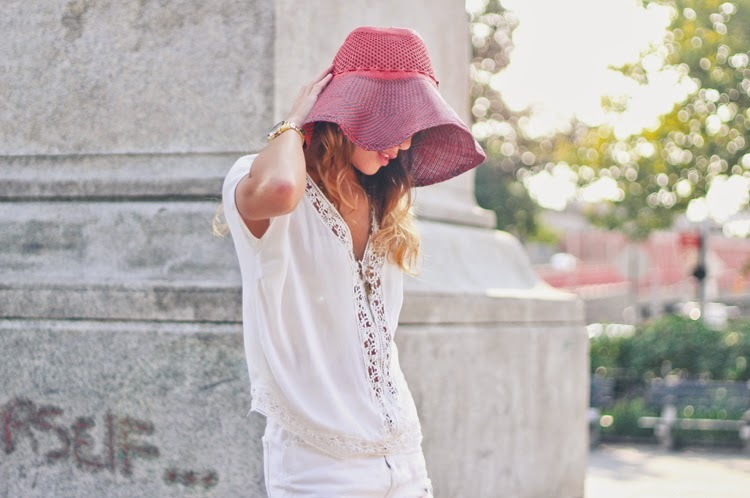 It's a wonderful accent for your otherwise all-white look; as is the crochet detailing of that top! !